Built 2008-2013 by Terry Dawson. Opened 11 Apr 2013 with a gala ceremony. First performance on 12 Apr 2013 with Philip Glass's "Spuren der Verirrten". 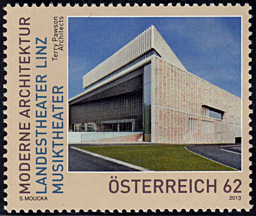 Used for opera, operetta, musical and ballet performances by the resident Landestheater Linz companies. The complex contains the main theatre (from 970 up to 1130 seats), two studio theatres ("BlackBox", 270 seats, and "BlackBoxLounge", 150 seats) and an orchestra rehearsal hall (200 seats). 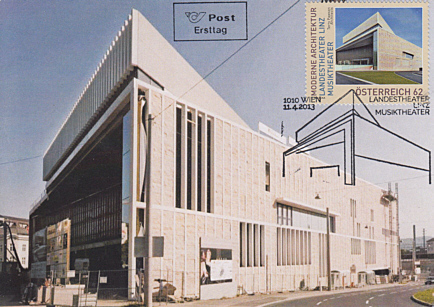 Text: "Moderne Architektur, Landestheater Linz, Musiktheater, "Terry Dawson Architects"